← Oil filter adaptor kit instructions added to ‘Technical Articles’ page. 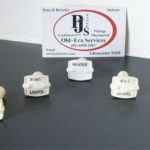 Spares Secretary Ray Dawes has asked that members’ attention is drawn to a supplier of parts for the A40s of our era, some of which are cheaper than he can obtain them for – in particular remanufactured dashboard knobs (see picture below). After several attempts to fulfill a rather long list of parts for my 51 Devon, I gave up after having received no replies from Old Era. Disappointing.